Finished off a great week's vacation by visiting our godson's family in Napa. Just a few miles down the road we stopped by the Suisun Valley Pumpkin Patch and had the best time. The weather was warm with a cool breeze (my favorite mix) and we were so happily surprised by the fabulous setup they had. There was a $3 admission fee, but they waive it if you purchase a pumpkin which is why we were there! 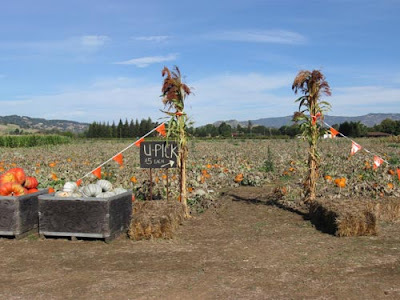 They had a scarecrow contest set up in front of the corn maze, 10 acres of u-pick pumpkins and the most amazing array of pumpkin varieties...they had pale gray pumpkins...I couldn't believe it. My Halloween this year is just a few pumpkins in white with black details. Very stark, dramatic and beautiful. I will post photos later of my finished vignette at my front door. One of the cutest areas was the pumpkin bowling. 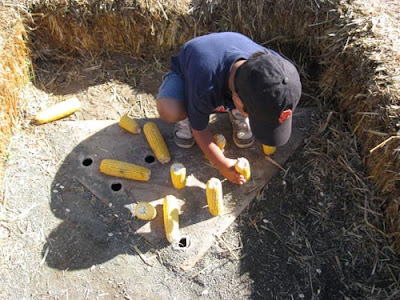 Bales of hay were set in rows to create the lanes and corn cobs were placed on top of holes in a strip of plywood. Nearly perfect round pumpkins in kid sizes were the bowling balls. My 3 year old nephew stayed there longer than any other area. It was so fun to watch him set up the corn cobs. It took a few minutes to find the "perfect" pumpkin. The fields near the game area had clipped pumpkins but further out you had to snip off the pumpkins with your own knife which is what my bro-in-law did. We ended our fun with him giving his son a wild ride in the wheelbarrow. We had so much fun and the prices were really good, like 4 little punks for only a dollar. The owner really made it a pleasant experience. I'm putting together some Chocolate Pink pendants & earrings and will photos in a day or two so be sure to check back to see those.